This ThunderBay 6 48TB 6-Bay Thunderbolt 3 RAID 5 Array from OWC / Other World Computing is pre-configured with six 8TB 7200 rpm HGST Ultrastar He8 Enterprise-grade drives set up in RAID 5 for data redundancy via SoftRAID XT software. 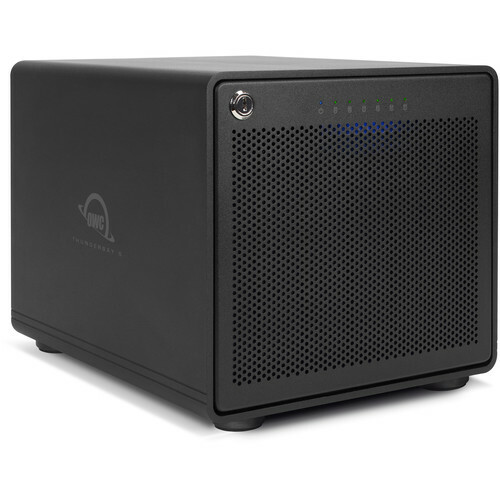 With two Thunderbolt 3 port featuring transfer speeds of up to 40 Gb/s, it's suitable for a wide variety of workflows such as video and photo editing, audio production, and much more. Its sustained performance is rated at up to 1500 MB/s. If needed, Thunderbolt 3 connectivity also supports daisy-chaining with up to six devices as well as DisplayPort-equipped displays. Using the SoftRAID XT software, you can reconfigure these drives from RAID 5 to alternate configurations including RAID 0, 1, 4, 10, and JBOD. Box Dimensions (LxWxH) 16.4 x 14.1 x 13.4"